He is the hottest item on the conductor’s circuit today. Since becoming music director, he has rejuvenated the Philadelphia Orchestra, spurring ticket sales and garnering raves internationally. Moreover, he is a welcome presence on the podiums of the world’s leading opera houses. It’s not exactly an unfamiliar story. An orchestra in trouble brings on board a new music director who turns things around and moves it forward on a sound footing. Yet seldom have the stakes been higher or the transformation more dramatic than with the Philadelphia Orchestra and Yannick Nézet-Séguin. In April 2011 the orchestra, one of America’s most prestigious and the city’s premier musical institution, filed for Chapter 11 bankruptcy protection, citing, among other financial woes, a high pension burden and losses from declining ticket sales and contributions.Today the orchestra’s problems almost look as if they belong to a distant past. With Nézet-Séguin poised to take over as music director two months later, the orchestra emerged from bankruptcy in July 2012 reenergized and rejuvenated. It has since reinvented its position as an object of civic pride. Ticket sales and contributions are up. In the 2009-10 season, the orchestra was playing to 65 percent capacity; by 2013-14 it was up to 80 percent, and Nézet-Séguin expects further growth. Today the orchestra’s problems almost look as if they belong to a distant past. With Nézet-Séguin poised to take over as music director two months later, the orchestra emerged from bankruptcy in July 2012 reenergized and rejuvenated. It has since reinvented its position as an object of civic pride. Ticket sales and contributions are up. In the 2009-10 season, the orchestra was playing to 65 percent capacity; by 2013-14 it was up to 80 percent, and Nézet-Séguin expects further growth. “Yannick provided positive inspiration throughout the painful process,” said Jennifer Montone, principal horn player. “He was the perfect person for the job—the timing was just right.” In the process, the Montreal native rose to the top ranks of international conductors and is now heralded for his work as music director of three orchestras. Moreover, he is in hot demand as a guest conductor and is a welcome presence on the podium of the world’s leading opera houses. The bankruptcy came after Nézet-Séguin, then 35 and not well known in the United States, was appointed music director of the orchestra in 2010—before his starting date. It was an inauspicious prelude to his tenure, to say the least. But he said in an interview that he “was never blindsided about the economic challenges,” which were made clear to him from the start. As for his decision to accept the post, “I never had any second thoughts.” It may not have been immediately clear, but in Nézet-Séguin the orchestra had at hand a powerful force for dealing with those challenges. Despite his youth, he had already been music director of the Orchestre Métropolitain, Montreal’s second orchestra, for 10 years, a post he continues to hold, and had led the Rotterdam Philharmonic since 2008, when he succeeded Valery Gergiev as music director. The event that clinched his appointment in Philadelphia, according to Allison Vulgamore, president and chief executive officer of the orchestra, was a glowing performance of Tchaikovsky’s Sixth Symphony at his first concert with the Philadelphians in 2008. “He struck an emotional chord that was unique and showed a clear recognition of the orchestra’s long commitment to lyricism,” she said. He also endeared himself to the orchestra by telling it that he had grown up with its recording of the symphony with Eugene Ormandy. As Nézet-Séguin explains it, the bankruptcy didn’t so much add an additional burden to his duties as it created a sense of urgency to move ahead with the job he wanted to do. Fortunately, the orchestra he inherited was “a well-oiled machine,” he said, which Charles Dutoit, who led it for four seasons on an interim basis, “did a wonderful job” of maintaining. “An orchestra is like a family,” Nézet-Séguin continued, “with players, management, staff, and a board as its members. The music director is at the center of all the interaction. He makes some tough decisions, but he also needs to be a peacemaker—you can’t make music without love or if there is anger in the heart. “And a music director who is not in tune with the needs of his city is not doing a good job. It was a priority for me to buy an apartment in Philadelphia as a symbol of reaching out to the community. I don’t know if it is a sign of the times or just me, but I want to be approachable.” He quickly became a recognized figure, whom everybody calls by his first name. He regularly attracts greetings on the street such as, “Hey, Yannick, that was a great Alpine Symphony last week!” and he makes time to acknowledge them. “It may take me longer to get to work, but it’s worth it. “Communication is so important—it’s not so much a marketing thing as trying to get a message across.” After every concert in Philadelphia, Nézet-Séguin reappears for a chat with anyone who wants to stay. At PlayIN events, players of a given instrument from all walks of life come to the Kimmel Center for mass gatherings to learn and perform. Neighborhood concerts and Pop-Up concerts are free. “It is also important,” he recognizes, “to talk to people who might put money into the orchestra,” a duty he does not shirk. “It’s an art to watch him in action,” said Harold Robinson, principal bass player, “whether he’s dealing with us or speaking to audiences or patrons. His work with an orchestra new to him typically begins with a stage in which they get to know each other by playing music of widely ranging styles and genres. With the Philadelphians results came quickly—“we didn’t need to talk a lot because we understood each other immediately.” With all three of his orchestras, including the Orchestre Métropolitain and the Rotterdam Philharmonic, he has reached the point where he can, as he put it, “use rehearsal time to go deeper inside the music and focus on style and sound.” “Yannick is more efficient in rehearsals that any conductor I’ve seen,” said Robinson. “There is always an order of importance in what to work on. Happily, concerts led by Nézet-Séguin regularly meet the high standards he sets for himself and the orchestras he conducts. The Financial Times has called him “the greatest generator of energy on the international podium.” His performances have brilliance and virtuosity but also an inherent rightness and logic in which the sum of the astutely conceived parts adds up to a richly satisfying whole. Although he is not particularly tall, he has a muscular, weight-lifter’s torso that exudes authority and energy. Players in the Philadelphia Orchestra say that it is entering a new golden age. “He is the best music director by far I’ve played under,” said Robinson, who started with the orchestra when Wolfgang Sawallisch was music director. 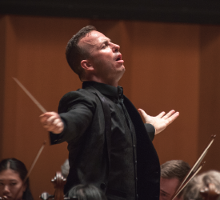 Nézet-Séguin’s energy was on display in spectacular fashion when he led 250 performers in Leonard Bernstein’s Mass last April and May in Philadelphia. The work has often attracted critical scorn for its unabashedly liberal sentiments and the extravagance of its musical diversity. But Nézet-Séguin’s thrilling performance, fueled by an underlying belief in the work that was palpable, was one to sweep doubts aside. On the tour, Nézet-Séguin continued his practice of promoting the distinguished heritage of an orchestra led by the likes of Stokowski, Ormandy, and Muti by featuring a work that was given its North American premiere by the Philadelphians, in this case the Rachmaninoff Third Symphony. A high point of the 2015-16 season, Nézet-Séguin promised, will be performances of Mahler’s Eighth Symphony in commemoration of the 100th anniversary of its North American premiere, which Stokowski led at the Academy of Music in March 1916. Moreover, in another historical parallel, Stokowski and Ormandy shared accompaniment duties on Rachmaninoff ’s RCA recordings of his piano concertos with the Philadelphians, and Nézet-Séguin has already recorded the Paganini Rhapsody with Daniil Trifonov and performed the Fourth Concerto with him this season. The Figaro recording is part of a Mozart series with the Chamber Orchestra of Europe that will comprise the seven mature operas. “Since the recordings are taken from concert performances, we can concentrate on the music so the singers can communicate everything with the voice. We strive for ‘naturalness’—that’s the key word—and the use of a fortepiano helps create a seamless line between recitatives and musical numbers.” Nézet-Séguin’s contract with DG, which is open-ended and allows him to record with different orchestras, is the kind of agreement with a major label that few conductors have nowadays. The conductor’s somewhat forbidding last name is simply an amalgamation of the surnames of his Breton parents, but that is largely a moot point given the preference everyone shows for calling him Yannick (pronounced Yan-NEEK). He began piano studies at the age of 5 and at 9 took up singing. By the time he was 13 he had already earned conducting assignments at the cathedral choir in Montreal; this led, while still in his teens, to choral-conducting studies at Westminster Choir College for two summers. He graduated as a piano major from the Montreal Conservatory in 1997, also studying composition, theory, and church music. Nowadays, his name is mentioned more than ever. He continued to be talked about as a possible successor to Simon Rattle at the Berlin Philharmonic even though his contract in Philadelphia had recently been extended to 2022. But his mix of work will soon change. The Orchestre Métropolitain, where his long-time partner Pierre Tourville plays viola, remains “very important” to him, but in 2018 he will give up the music directorship in Rotterdam to free up time for Philadelphia.